Rubber Room Ramblings: WHEN CAN WE EXPECT SPRING? February 2nd is GroundHog Day~~the official "telling" of when spring will arrive! 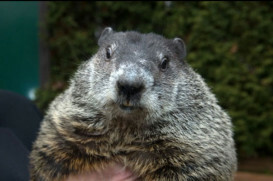 Will the world-famous Punxsutawney Phil groundhog in Punxsutawney, PA see his shadow on February 2, 2012? If he does~~there's going to be six more weeks of winter. If he doesn't~~the forecast is for an early spring. So far it's been a fairly mild winter here in Michigan, and I'm hoping for an early spring!